Banks bought gold from the miners. This meant that employees often carried large amounts of cash and gold, making them targets for robbers. 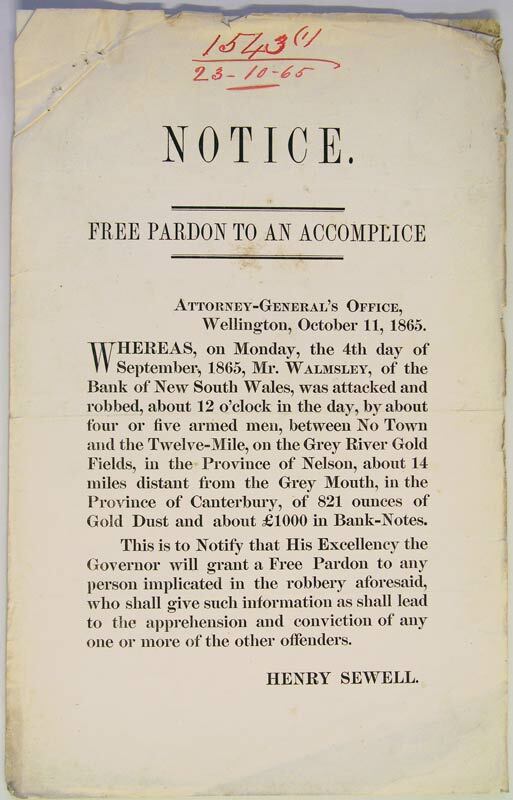 The notice above offers a free pardon to any one of the thieves in this West Coast robbery who testifies against his accomplices. In the incident noted the robbers made off with gold dust and banknotes worth about $650,000 in 2005 currency. Permission of Archives New Zealand Te Rua Mahara o te Kāwanatanga (Christchurch Regional Office) must be obtained before any re-use of this material.